After completing her winning test aboard Rosevelt in the Dressage At Devon Grand Prix Special Sept. 28, Allison Brock breathed a sigh of contentment. She had been looking forward to this moment since she was a kid—the moment she found her place amongst top competitors at one of the most prestigious dressage shows in the nation. “It’s such an old show, and it’s one of those shows that you heard about all the time when you’re a little kid, and you go, ‘Maybe one day I’ll get to ride Dressage At Devon.’ “ said Brock. 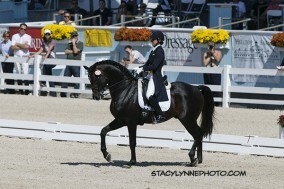 “When I entered the show, I just felt like, ‘I can’t believe I’m entering Dressage At Devon to ride the Grand Prix. What kind of dream is this?’ Then to have ‘Rosie’ do so well—it hasn’t even hit me yet. Brock and Rosie impressed the judges with their performance in the Grand Prix for the Special Sept. 26, and took home their first blue ribbon of the weekend. And on the fourth and final day of competition, Sept. 28, Rosie was anxious to passage his way into the top spot yet again. But once the stallion, a 12-year-old Hanoverian (Rotspon—Lore), owned by Fritz and Claudine Kundrun, was under saddle and warming up for the Special, he settled down and concentrated on Brock. The pair earned a score of 72.96 percent to claim the win, while her trainer Michael Barisone rode Lauren Sprieser’s Ellegria to second place on 69.80 percent. Brock, of Kewick, Va., had a similar strategy for Rosie going into the Special as in their previous test. “Honestly, I had a bit of the same plan from the first day,” said Brock. “There were just some details that I knew that happened in the Grand Prix [for the Special] that I wanted to see if I could improve on. I wanted to really sit him down and do crisp passage transitions, which I think he did. Mostly, I just wanted to ride as accurately as I could with control and by the end of that final centerline, I would still have enough power so that [the judges] had the feeling that I could keep going by the time he gets to the end of the test. For now, the stallion will travel back home to Virginia and enjoy a well-earned break before heading down to Wellington, Fla., for the winter CDI circuit, where he and Brock will debut their freestyle. “I have [a freestyle] built, and I actually took him out to a little show a few weeks ago and ran him through it just to see how he would do and check the tempo, so you’ll see that at Florida,” said Brock. Want more Dressage At Devon? Check out the all of the Chronicle’s online coverage of the event here. Also look for in-depth coverage of both the breed and performance divisions in the Oct. 13 issue of the print magazine The Chronicle of the Horse.